Winner of the ASLA 2016 Honor Award, Residential Design Category. The project, Water Calculation and Poetic Interpretation, was completed by Arterra Landscape Architects. 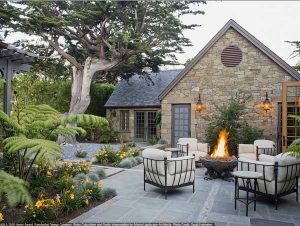 Consumers prefer sustainable—yet tech-friendly—design elements in their outdoor living spaces, according to the 2017 Residential Landscape Architecture Trends Survey conducted by the American Society of Landscape Architects (ASLA). “The fact that more consumers want outdoor wireless access shows that they want expanded options for remaining connected to their devices,” said Nancy Somerville, executive vice president and CEO of ASLA. Landscape architects were asked to rate the expected popularity of a variety of residential outdoor design elements in 2017. The survey, which was fielded Feb. 2 through Feb. 16, had 817 respondents. The survey also took a look at the expected popularity of various products and features in five categories, including outdoor design elements, outdoor recreation amenities, landscape/garden elements, outdoor structures and sustainable elements. Geothermal heated pools (28.36 percent).